Men who want to improve their chances with the ladies should consider palling up with a feline friend to help attract a partner, according to a survey out today. Feline welfare charity Cats Protection found that women think cat-loving men possess many qualities they find attractive when looking for love. The research, which was carried out for Valentine’s Day, found that six in 10 women across the UK think men who own cats are more caring, making them more appealing as a partner. And far from being seen as wimpy, cat ownership appears to be a manly quality as just 27% of women think cat-owning men are soppy. 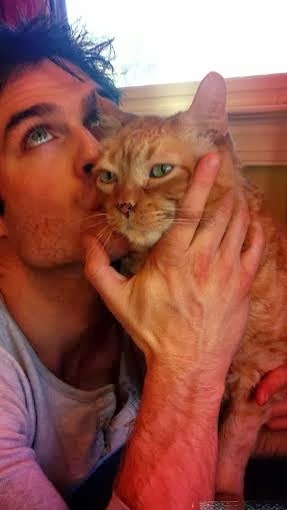 Star of ‘The Vampire Diaries’ Ian Somerhalder is not short of female admirers and the photograph Ian has donated to Cats Protection to celebrate Valentine’s Day perhaps shows why – the cute image of him cuddling his cat Moke definitely shows his caring side! Men (or women) wishing to adopt a cat can visit the charity’s website at www.cats.org.uk or call the charity’s helpline on 03000 12 12 12 to find out more. If my other half is anything to go by, cat-loving men are definitely soppy. In a good way!